Today the #SundaySupper Tastemakers are recreating favorite restaurant recipes. Be sure to scroll down past my recipe where you'll find links to all of the restaurant inspired copycat recipes. I'm looking forward to trying all of the flavorful recipes my #SundaySupper family has in store for us this week. 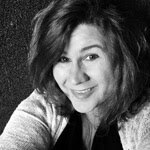 A big thank you goes out to our fabulous host, Coleen of The Redhead Baker, for making this event possible. Don and I don't eat out much for several reasons, but mostly because we just don't enjoy it. We love to eat fresh and flavorful meals at home. When we do go out to eat it is either disappointing because the food lacks flavor, or it is so expensive, we can usually make the meals at home for much less. Which is why I love the #SundaySupper theme this week! I hope we inspire you to eat at home to save your hard earned $$$ while experiencing exciting new flavors you only get with home cooked meals. 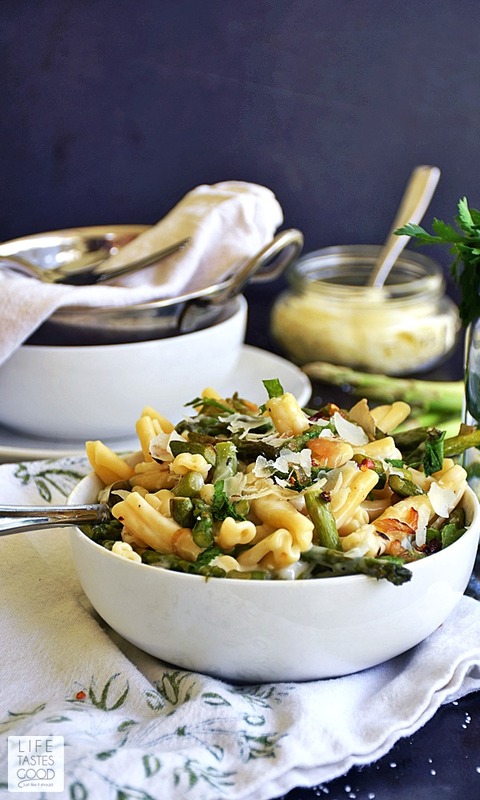 My recipe isn't a copycat 'restaurant' recipe, it is inspired by Trader Jacque's Shells with Brie and Asparagus. On a recent road trip, we were just too tired to dine out, so we stopped in at Trader Joe's to pick up some goodies to enjoy in our hotel room. We decided to get some pre-made sandwiches as well as some frozen meals. I spied the Trader Jacque's Shells with Brie and Asparagus and was instantly intrigued. I also picked up a Caprese Sandwich which really hit the spot. Oh my goodness was it ever delicious! Or maybe I was just really, really hungry from traveling all day. Either way, I'll be recreating that one at home too, so be on the lookout for the recipe soon! I never did get to enjoy my Shells with Brie and Asparagus, but Madison did and she loved it! I am so glad I looked at the ingredients, because I couldn't get that combo off my mind. I just knew I had to recreate it at home. 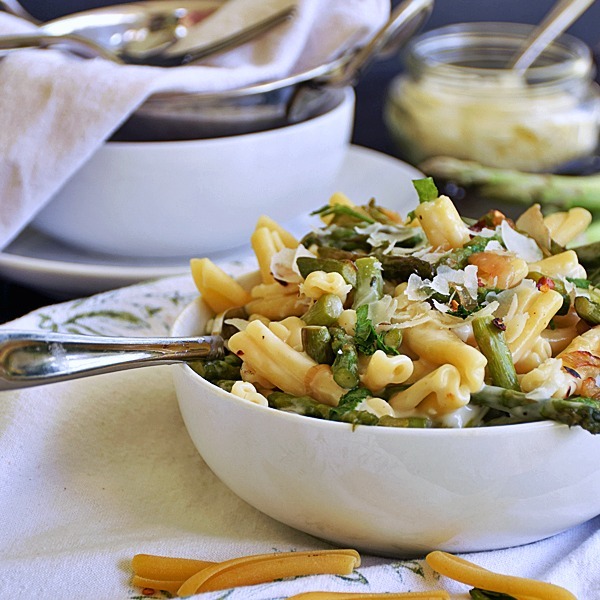 The crispy crunch of the sauteed asparagus contrasts nicely with the soft, but firm, pasta which seemingly holds just the right amount of creamy brie cheese sauce on every piece, creating the perfect bite with each exquisite forkful. The comforting goodness of this recipe keeps us coming back for more! In the same pot, melt 2 tablespoons butter over medium heat and saute 1/2 tablespoon of freshly minced garlic with 1/4 to 1/2 cup of finely diced shallot for about a minute until the vegetables begin to soften. Add the asparagus pieces and a pinch of sea salt and saute until the asparagus starts to soften - about 2 minutes. Remove the vegetables from the pot and set aside. 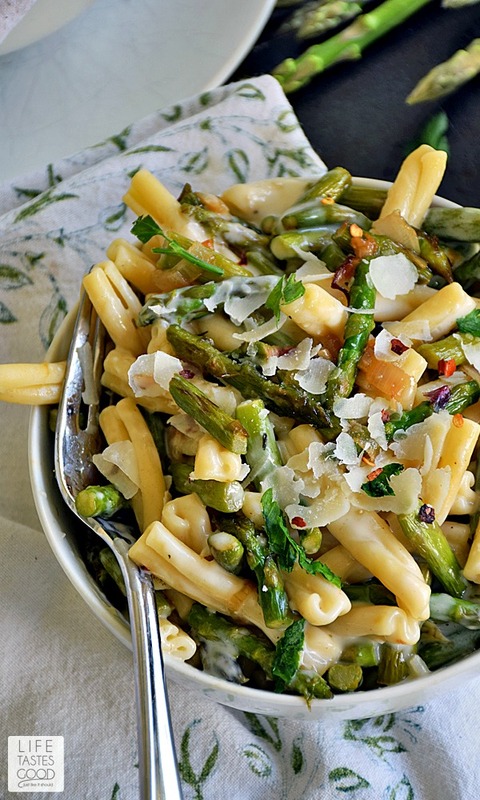 The asparagus should still have some crunch to it when you remove it from the pan. In the same pot, prepare the Bechamel Sauce as outlined in the tutorial here. As soon as the Bechamel is thickened, remove it from the heat and add in the diced Brie Cheese. Stir until the brie is melted and the cheese sauce is velvety smooth. Give it a taste and add salt and pepper as needed. TIP: Be sure you remove the rind from the brie before adding it to the Bechamel. The rind won't melt nicely, so it's best to remove it and then dice the cheese. If you put the cheese in the freezer for about 30 minutes it will harden up and the rind will be easier to remove. 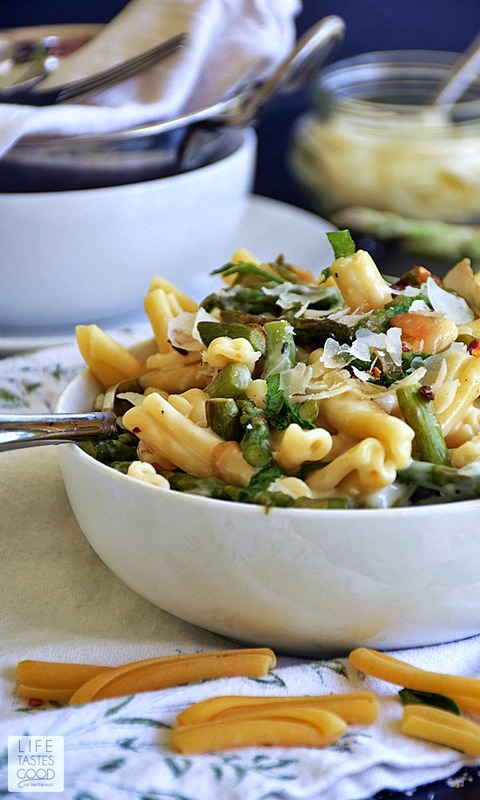 Toss the pasta with the brie cheese sauce and top with the sauteed vegetables. Garnish with fresh Parmesan cheese and parsley if you like. For a little extra kick, sprinkle on some crushed red pepper flakes. Enjoy! Looks and sounds amazing Marion! I love the combination of ingredients too! Mac and cheese with Brie??? And asparagus??? Definitely a dish we'd love at our house!!! I love brie and asparagus. What a great way to bring them together. Very creative to be inspired by a supermarket dish. 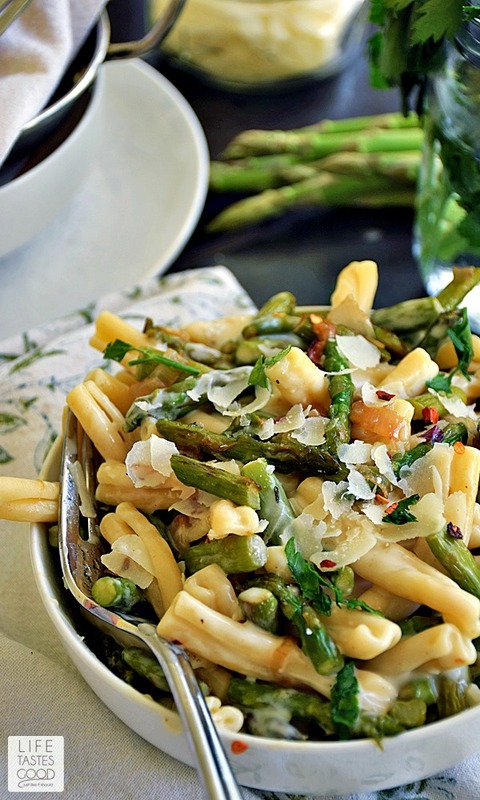 I've also never thought to put asparagus in a mac and cheese. Very inventive! 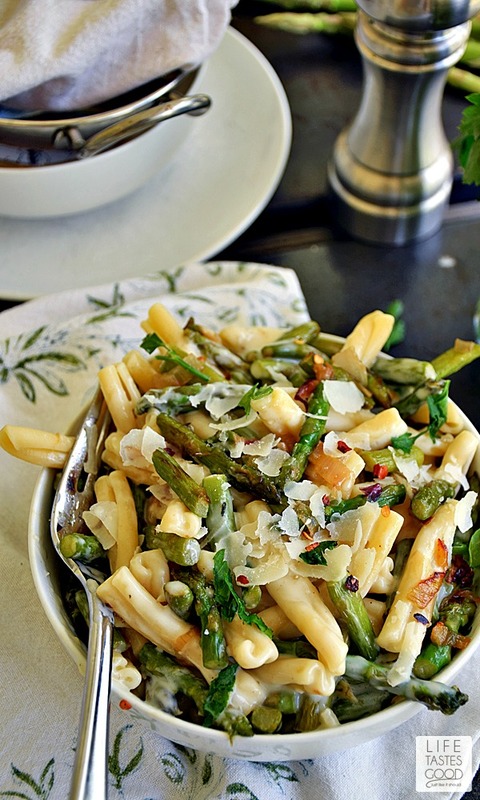 I love asparagus in pastas - this one looks fabulous! I'm definitely intrigued by brie in it. I've only ever had brie in a sweet dish. What a beautiful dish! I love the presentation! It looks yummy! Oh my goodness, you have elevated mac and cheese to new heights! Great recipe~love it! Looks like such a great dish, easy but delicious flavors! Brie & asparagus - what's not to like!! I could eat the picture!